The increase in overland travel after 1842 resulted in the establishment of a chain of military posts across the West to protect the travelers. Early in 1846 the first of these posts was built by the army in this location near the mouth of Table Creek, an area explored and selected by Colonel Stephen W. Kearny. A two-story blockhouse was erected about 1/2 block west of here. Subsequently, a number of log huts were built as temporary shelter for the troops. The Table Creek site was not on the main route of overland traffic and relatively few emigrants passed the fort. The War Department, in 1847, selected a new site on the widely used main branch of the Oregon Trail. Fort Childs, later designated as Fort Kearny, was built near the Platte River, in present day Kearney County. The Old Fort Kearny area remained important as the beginning of a secondary route of the Oregon Trail, the Nebraska City-Fort Kearny cut off. Nebraska City was started at the site. The blockhouse was used as a printing office, justice court, jail, drugstore and butcher shop. A replica of it was dedicated in 1938. 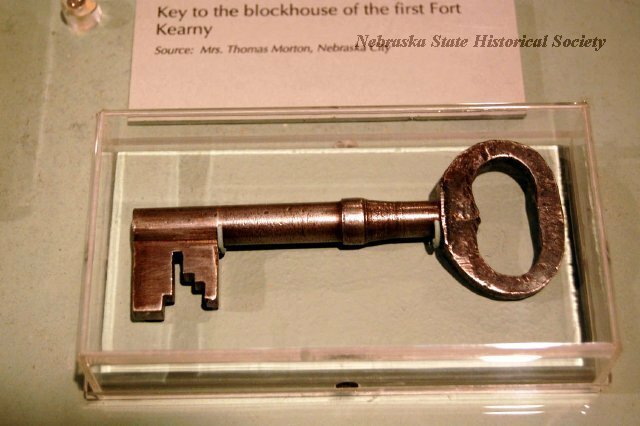 “Old Fort Kearny,” Explore Nebraska History, accessed April 19, 2019, https://mynehistory.com/items/show/382.